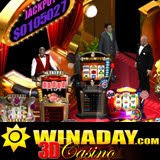 The progressive jackpot at 3D casino WinADay.com has just gone over $100,000 and players at the unique slots and video poker site are getting the feeling that the next big jackpot win could happen any day. There aren’t a lot of statistics to base that feeling on. Although it’s operated by one of the oldest online slots sites (Slotland.com) WinADay.com just celebrated its first birthday this summer and has only had four major jackpot winners to date. So far, the jackpot at WinADay.com has been rising to about $150,000 before someone gets lucky and wins it. There’s also usually been about three months between wins, too, and it’s only been a month and a half since the last one. So it may be a bit premature to expect the next win to be imminent. The last jackpot winner at WinADay.com was Marlieska won $153,977 in August playing the new Vegas Mania. Monica68 won WinADay’s very first big jackpot, ($148,724 (€116,200), on the Wheeler Dealer slot machine. Then, right after the single-payline Slot-O-Matic was launched, “123jaki” played it to win $159,660 (€123,620). In May BONDGIRL won $100, 224 (€73,970) – the second big jackpot to be won on the Wheeler Dealer. There’s nothing to download or install at WinADay.com. It’s an instant-play casino so players can go straight to the three-dimensional games lobby where animated casino staff will help them decide which of the eight one-of-a-kind games to try first and be playing in minutes. The progressive jackpot at WinADay’s parent site, Slotland.com, has risen to over $160,000 and is also teasing players with the prospect of a very big win on the very next spin. 3D casino has completely changed how I look at online business. It fits our needs perfectly. I love your system.